15% Off First Orders Plus Free Delivery on Orders Over £15 at Fabled If it's your first time shopping at Fabled, stock up on your favourite beauty buys and get 15% off! £5 Worth Of Bonus Points on Orders Over £60 at Fabled Collect those points and treat yourself! Up to 1/3 off Maybelline Products at Fabled When you're stocking up on Maybelline products, save yourself up to 1/3 when buying from Fabled! Up to 70% Off in the Clearance at Fabled Don't miss the huge savings you could make when shopping the sale at Fabled! Free Delivery on Orders Over £15 at Fabled Spend over £15 at Fabled and get your goodies delivered for free! Free Gifts with Orders at Fabled - Including Foreo, Urban Decay, & More Everyone loves to receive a little something extra with their purchase, that's why at Fabled you can get a free gift with your order. 50% Off Selected Nip+Fab Orders at Fabled Your favourite Nip+Fab products, with 50% off at Fabled! Free Returns on Orders at Fabled No need to worry if you change your mind about your recent purchase, Fabled offer free returns. Limited Edition Make Up from £10 at Fabled Weren't able to grab it while it was in store? Fabled have got selected limited edition make up from £10, including Nars, Urban Decay and Bobbi Brown! 25% Off Max Factor Orders at Fabled Explore the Max Factor range at Fabled and get 25% off! Free Gift on Clinique Orders Over £40 at Fabled Get a free skin hydrating set when you spend over £40 on Clinique at Fabled! Free Gift on L'Occitane Orders Over £35 at Fabled Spend over £35 on L'Occitane products at Fabled and get a free gift! 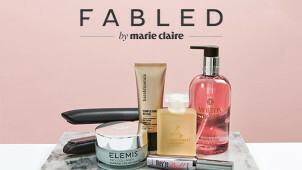 With 27 years’ experience in educating and inspiring people everywhere in their skincare and make-up routines – you can count on Fabled by Marie Claire to put you in good and healthy beauty stead. Fabled is dedicated to giving you access to the hottest beauty brands on the market, both the known and the newbie, soon to be gems. Shop a whole host of renowned and loved brands like Estée Lauder, Nars, Urban Decay and everything in between - with an abundant offering of Hair Care, Makeup, Wellness items and more – you will be certain to find the product of your dreams with Fabled. For both men and women, you can target your skin ailments here. Perhaps you have particular concerns such as redness or sensitivity; Fabled caters for all skin types so that you can feel confident in yourself – every day. With gifting options to suit all discerning beauty buffs and those who are in need of a little pampering too - discover Fabled today and you'll be sure to find a gift that they'll cherish. You could even browse the Marie Claire Edit for inspiration, makeup tips and all-round beauty advice - this is where you will find out what's trending each season as well as invaluable guidance on how to take care of your skin, body and spirit too. How do I use my Fabled voucher? Offers that don’t require a voucher will be discounted automatically so you can checkout securely. Choose to sign up to the Fabled newsletter when you create your account to be kept in the know about great offers and vouchers which may be available! Does Fabled offer student discount? This isn't available yet, however, we'll let you know should anything change. Where is The Fabled Store? The Fabled flagship store can be found in the heart of London on Tottenham Court Walk. Check it out to discover Skin Bars and even a Colour Studio. When is the Fabled sale? There may be seasonal sales, but you will be able to find plenty of offers here on vouchercloud plus some clearance items dotted around the Fabled store online too. Next Day Delivery: FREE over £15, otherwise £3.90 (order by 3pm). You'll always be given a 1-hour delivery slot. Returns are FREE and you have 30 days from the date of receipt in which to return your goods for a refund. Do read the full returns policy. Call: 0330 123 0500, 5:30am to midnight, 7 days a week. Email: hello@fabled.com or send them a message online. Fabled, brought to you by Marie Claire, is a wonderland of unique beauty brands to give you beautiful results from both your skincare and makeup. Discover it all with a Fabled discount code from vouchercloud to help you save on exquisite products and invaluable advice. Here you can find your hero products, and the latest makeup releases as well as a hearty confidence boost - don’t wait to start your story today with Fabled. Although separate businesses, Fabled is in fact partnered with Ocado - that amazing online grocery retailer - which means that you can link your Fabled order to your grocery one for free! There is no minimum charge either so you can get your fruit, veg and favourite cleanser delivered altogether and when it's most convenient for you. Always keen to look and feel preened, at vouchercloud, whether we want a natural day or party look - the Fabled make-up selection is our go-to for exquisite beauty buys. This is where you can create the complexion you want and with new eye palettes, foundations and more available for less with a Fabled voucher code from us, you're sure to stand out from the crowd. From complexion perfection to a killer lip, shop NARS, Urban Decay and many more brands this season, you can make it happen with new season pickings from Fabled.